HIDDEN in a tropical rainforest of southwestern Yunnan Province’s Xishuangbanna Dai Autonomous Prefecture is an elephant paradise. The Xishuangbanna Wild Elephant Valley is China’s first national theme park for the animal and claims to be the only place in the world where you can safely observe wild Asian elephants at close quarters. “The wild elephants get cranky if they are disturbed,” one of the park’s employees Chen Jiming tells China Tourism News. “We check how the elephants are feeling every morning, take their temperatures, check their feces and clean their sheds,” says Chen. And the elephants are then led for exercises. 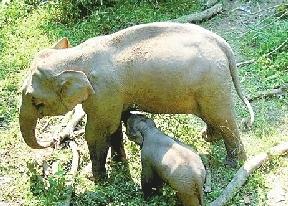 Wild Asian elephants are under the State’s first-class protection and mainly live in Yunnan’s Xishuangbanna, Pu’er and Lincang. At the moment, around 10 elephants receive professional medical care and rehabilitation training at the park, according to Feng Jin’e, the deputy general manager of the site.